Retired Los Angeles police detective Steve Hodel became a minor true crime celebrity due to his claims that he had solved the infamous “Black Dahlia” murder. Hodel accused his own father, the now-deceased Dr. George Hill Hodel, once named as a suspect in the 1947 “Dahlia” killing. According to Hodel’s account, he began his journey of suspicion shortly after his father’s death, when he discovered two photographs among his father’s possessions. The images depicted a young, dark-haired woman and Hodel concluded that the woman was actually “The Black Dahlia” murder victim Elizabeth Short. A retired LAPD detective, Hodel began his own investigation and eventually claimed that his father was responsible for dozens of unsolved murders in the Los Angeles area and beyond as one of the most sadistic, demented and prolific serial killers in American history. * A photograph in Short’s possessions may have been George Hodel and may have been the man seen with Short prior to her death. TV producers hired experts who concluded that Elizabeth Short was not the woman in Hodel’s photographs. Even a cursory comparison of Short’s many photographs with those presented by Steve Hodel proves that Short is not the woman in Hodel’s pictures. Members of Short’s family also dismissed Hodel’s claims, stating that the woman in his photographs was not Elizabeth Short. Ignoring the conclusions of the experts and Short’s own family, Hodel’s subsequent editions of Black Dahlia Avenger featured more strained attempts to link Short to the photographs. Hodel admitted that the woman in the first photograph is not Short but he still believed that she is the woman in the second photograph. Today, Hodel says that the issue is “moot” because one official stated that George Hodel had been seen with Elizabeth Short. Documents examiners questioned and contradicted the conclusions of Hodel’s handwriting expert. 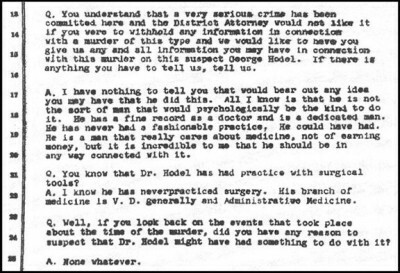 The official transcript of George Hodel’s statements indicates that his remarks were not as incriminating as his son suggests. The official documents also state that the transcripts and other evidence “tend to eliminate this suspect.” Hodel insists that his father’s statements indicate his guilt. As other aspects of the George Hodel theory also collapsed under scrutiny, Steve Hodel remained undeterred and continued with his quest to convict his father in the court of public opinion. James Elroy retracted his endorsement of Hodel’s theory, explaining that he was wrong. Hodel dismissed Elroy’s withdrawal as a conflict of interest because the feature film version of Elroy’s Dahlia novel offered a different conclusion than Hodel’s. Like the unsolved Zodiac case, the Black Dahlia mystery has its own cottage industries, personalities and theories/factions. In Dahlia circles, Hodel’s theory remains a controversial chapter in the history of that case. 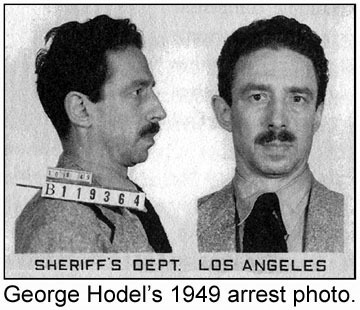 Perhaps George Hodel did know Elizabeth Short– to date, I have yet to see Steve Hodel present any credible evidence to implicate his father in her murder. However, his attempts to link his dead father to the Zodiac crimes will be forever remembered as one of the greatest acts of fraud in the history of nonfiction. Most Evil is, by any definition, a true crime, an act of fraud. As a reader, I often wondered if Steve Hodel was just pulling my leg for a buck. Hodel now claims that his father committed some of the most notorious murders in the annals of crime. 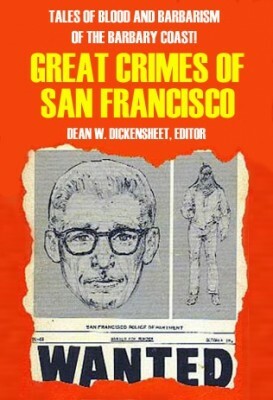 In the introduction, Hodel wrote, “I know now that my father was also responsible for a series of infamous murders in Chicago (where he was known as the Lipstick Killer), Manilla (where the local press dubbed him the Jigsaw Murderer), and the Bay Area of California (where he called himself Zodiac).” Based on his previous track record, most readers would be forced to view this statement with skepticism; others might need a moment to collect themselves as they struggle to suppress the growing and probably-by-now uncontrollable fits of laughter welling up, ready to explode. As I read through the book, I was astounded by the many unsubstantiated claims and leaps in logic, based on little more than speculation and rampant generalizations. Like Robert Graysmith, Howard Davis, Gareth Penn and so many others, Steve Hodel’s theory seems compelling as long as you are not aware of the true facts. A complete assessment of Most Evil would take up more space and time than I care to commit here, but I will offer the following examination. Steve Hodel cites the opinions of documents examiner Hannah MacFarland in order to link his father with the Lipstick and Zodiac crimes. MacFarland was also the same expert who had determined that George Hodel was the author of various Dahlia-related notes, despite the fact that there was no evidence linking these notes to the Dahlia killer. Other experts had contradicted MacFarland’s conclusions. In his book, Hodel repeatedly misquotes the Zodiac’s words, placing a hyphen where the Zodiac had clearly written a small letter “r” [as in “Lake He-Man”] and his transcriptions of various letters or writings are frequently incorrect. Such errors can be found throughout the book [pg. 124, pg. 142, and more]. Hodel’s theory also relies on a letter of dubious origins which appeared in a newspaper article [see pg. 243]. The book also contains many factual inaccuracies regarding the Zodiac crimes and errors which are often baffling. On page 211, Hodel writes, “Land Art, also known as Earthworks, is a movement said to have been launched in October 1968 with the group exhibition ‘Earthworks’ at the Dwan Gallery in New York. Zodiac’s first Bay Area murder occurred just one month later, in December 1968.” Anyone with basic math skills will immediately notice the glaring error in Hodel’s calculations; readers who completed the book will recognize this seemingly simplistic error as foreshadowing of things to come. George Hodel was sixty-two years old at the time of the Zodiac’s last known murder, and even the oldest estimate of the suspect’s age ranged somewhere between 35-45 years old. The witnesses who observed the killer on the night of October 11, 1969, in San Francisco, provided a description which cannot match Hodel by any stretch of the imagination. Throughout most of his life, George Hodel was seen wearing a dark moustache; none of the witnesses stated that the killer wore a moustache. Steve Hodel speculates that his father may have shaved off the moustache at various times but there is no evidence that he did so at this time, or that he regressed in age by two decades. On page 109, Hodel wrote, “The evidence linking my father, Dr. George Hodel, to the Zodiac murders in the San Francisco area in the summer and fall of 1969 is exceptionally strong and compelling.” Readers will note that Steve Hodel’s book fails to provide any such evidence and instead offers only speculation, assumptions and tenuous “links” to support this theory. In fact, the only “evidence” presented by Hodel consists of the questionable conclusions of his handwriting expert. On page 211, Hodel accurately describes the value of a radian as 57 degrees, 17 minutes and 44 seconds. Hodel then uses an apostrophe-like symbol to denote degrees when the correct symbol actually resembles a small circle. Hodel’s later illustrations read, “58-59’ – radian,” as if the author does not even understand the concept of a radian or had somehow forgotten his previous and correct description of the angle. Hodel offers several illustrations to prove his Zodiac/Short radian theory, yet, in each illustration, Hodel’s placement of the relevant locations is clearly incorrect. On page 212, Hodel presents a copy of the Zodiac’s Mt. Diablo map: his placement of the Stine scene in San Francisco is far South of the correct location, and his placement of the Blue Rock Springs Park scene is far Southwest, nowhere near the correct location. 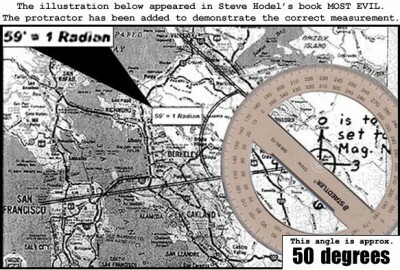 The caption on this map reads, “59′ = 1 radian” despite the fact that a radian is valued at 57.3 degrees. Even more baffling is the fact that the actual angle formed on Hodel’s illustration is approximately 50 degrees– Hodel’s illustration does not form a radian and does not even match his own stated value of the angle. The same lack of research and factual accuracy is displayed in Hodel’s second illustration, an aerial photograph on page 215. Again, Hodel’s stated value of a radian is incorrect, and his caption reads, “58-59′ – radian.” Once again, Hodel’s placement of the relevant scenes is incorrect, and his placement of these locations does not even match his previous illustration. On the aerial photograph, Hodel places the Blue Rock Springs Park crime scene far West of the correct location, directly above the gravesite of Elizabeth Short. However, the actual location does not align with the gravesite in this fashion, and Hodel’s placement of this location does not match his previous illustration, either. Again, Hodel’s stated measurement of his angle does not match the value of the angle shown. In this illustration, Hodel’s angle measures at approximately 54 degrees, far short of a radian and nowhere near the “58-59” degrees Hodel claims in his caption. The same flaws and errors appear in Hodel’s third illustration on page 248. Here, Hodel presents another map, and, again, his placement of the relevant scenes is incredibly inaccurate. Hodel places a copy of the Zodiac’s November 9 crossed-circle over Mt. Diablo, but he did not place the center of the crossed-circle on the peak of Mt. Diablo– in fact, the center of this crossed-circle is clearly not aligned with the peak or Hodel’s lines on the map which are drawn to the peak itself.Again, Hodel’s placement of the relevant scenes is inaccurate. He places the Blue Rock Springs Park site far West– again, nowhere near the correct location. Hodel’s placement of this scene does not match his previous illustrations, and his placements of the Short gravesite and the Stine scenes are also incorrect. In this illustration, Hodel presents another angle from his placement of the Blue Rock Springs Park scene to his version of Magnetic North. Hodel’s caption for this second angle reads, “58-59′ radian.” Once again, the author misstates the value of the radian, once again using the incorrect symbol to denote degrees. This value of this angle is nowhere near a radian and does not even match Hodel’s caption of “58-59” degrees. In fact, this angle is measured at approximately 75-76 degrees, far greater than a radian or Hodel’s stated value. In the same illustration, Hodel presents the other radian, allegedly formed by his placement of the two scenes, BRSP in Vallejo and the Stine scene in San Francisco. Again, Hodel’s caption reads, “58-59” radian. Again, this angle is nowhere near a radian value and does not even match Hodel’s caption– this angle measures at approximately 53 degrees. A straight line drawn from the peak of Mt. Diablo to the scene of the Stine murder in San Francisco does not pass through Mountain View Cemetery or anywhere near the grave of Elizabeth Short. Hodel wrote, “The mathematical probability of it being coincidence is infinitesimal. The Zodiac murders and the murder of Elizabeth Short must have been connected.” Hodel’s entire premise is false and, therefore, his claim that the Zodiac and Dahlia crimes “must have been connected” has no merit and is not based on fact. Are we to believe that Steve Hodel didn’t know that his book was so inaccurate in so many ways, that his own theories were so wrong on so many levels, that his own illustrations and measurements don’t match his own notations and claims? The notion is most unsettling. As you can see, the two illustrations below prove that Hodel’s illustration and explanation are 100% false. 1 = Presidio Heights: The lower line of the Hodel’s “radian” in his illustration does not intersect Presidio Heights, let alone the scene of the Stine murder; in fact, this line falls so far South that the line not only misses the crime scene but the entire Presidio Heights neighborhood altogether. This line is so far below the actual location as to pass through Golden Gate Park, nowhere near Presidio Heights or the Stine scene. #2 = Blue Rock Springs Park: The upper line of Hodel’s “radian” does not pass through the crime scene at Blue Rock Springs Park. In fact, Hodel’s line falls so far Southwest of the correct location that it not only misses the crime scene but the entire park itself. 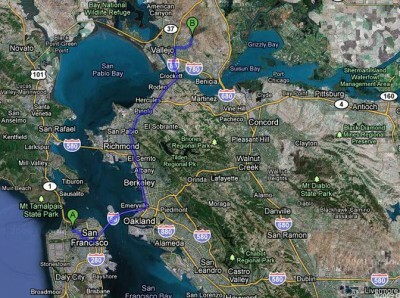 Further, the line almost misses the entire city of Vallejo. And it gets worse. Hodel claimed that this line passes through the crime scene, citing his illustration of the upper portion of the Zodiac’s map. If Steve Hodel had conducted legitimate research– or spent two or three minutes using Google maps– he never would have written that this line passed through the BRSP crime scene because the BRSP scene and the park do not even appear on the Zodiac’s map. The map is clearly cropped well below this location (as demonstrated in illustration #2). Once again, Hodel’s facts fail under even the most minimal scrutiny. Steve Hodel claims that his father had murdered several victims in Chicago and that Short had traveled there to investigate his possible involvement. Hodel also claims that his father killed Short because she may have been ready to expose him as the killer in the famous dismemberment and murder of a little girl “She died because of what she’d learned about my father’s savage activities in Chicago,” Hodel wrote in Most Evil. According to Steve Hodel, his father killed Short and then severed her body in two parts– thereby drawing attention to the similarities to the Chicago dismemberment murder– and then displayed her mutilated corpse on a city street– thereby making the crime a sensational and very public story that was bound to generate intense scrutiny and investigation, drawing attention to himself as well as the connection between the Short and Chicago murders, or, far more importantly, suggesting that Short had been killed by someone with links to both Los Angeles and Chicago. Yet, according to Steve Hodel, his father did all of this after he had been seen with Short in public, not only in Los Angeles but in Chicago as well. Had Short simply disappeared, the crime would have gone virtually unnoticed, there would be no “Dahlia” frenzy, no investigation, no Grand Jury probe, no wiretaps, no problem at all. In this theory, Hodel’s power could not save him from the morals charge and he was forced to buy his freedom to escape that minor conviction yet his guilt in the Dahlia killing was covered up by officials free of charge. These authorities preferred the embarrassment that resulted in their failure to solve the most shocking crime in recent history and decided it was better to let George Hodel run amok for decades, claiming more lives, free to expose them at the drop of a hat while they risked their own careers to make sure the case remained unsolved and Hodel escaped justice. Theorists who have been discredited, debunked and dismissed are always quick to cry conspiracy with claims that authorities are concealing the truth which would prove their theories, and Hodel is right on schedule. If I had written Most Evil I would be too ashamed to leave my house. On his website, stevehodel.com, Hodel reports that he will soon present a “Black Dahlia Power Point Talk” to the Century City Bar Association on May 26, 2010, in Los Angeles. The author provides booking information for the event at the Westside Tavern; those who are not members of the Bar must pay $40.00 to attend. Will Hodel begin the Power Point presentation with the compelling new evidence from his book Most Evil? Will he explain to the audience that none of his Zodiac illustrations are accurate and all of his claims are bogus? Will Hodel have the courage or integrity to correct his own work or retract his claims? If so, some in the audience might want a refund. Most likely, Hodel will do what others have done in the past when confronted with their own reflection– blame the messenger or cry foul. Perhaps Steve Hodel will claim that I have highlighted the flaws of Most Evil because I have written a book about the Zodiac case or maybe he’ll follow in the footsteps of Dennis Kaufman and offer the ridiculous claim that I’m just one of those people who doesn’t want to see this case solved because we would lose our livelihoods. Perhaps Hodel will blame his co-author and claim that he didn’t know that so much of the material in Most Evil was inexcusably incorrect. Maybe Hodel will accuse some unnamed assistant who was responsible for the illustrations in his book, or point the finger at a lazy editor. Or maybe he’ll claim that his own measurements and maps were accurate but somehow distorted in the printing process. Perhaps Hodel will fall back on the standard line and reply that he was only speculating that his father was the Zodiac, that it’s “just a theory,” or that he had only said his father “may” be involved in these crimes, asking us all to forget that he began his book with this claim: “I know now that my father was also responsible for a series of infamous murders in Chicago (where he was known as the Lipstick Killer), Manilla (where the local press dubbed him the Jigsaw Murderer), and the Bay Area of California (where he called himself Zodiac).” Given the evidence presented in Most Evil, Hodel has obviously failed to substantiate this claim by any stretch of the imagination.